Dayan (Wild Goose) Qigong is an ancient Chinese movement form that was first developed by the Taoist Monk, Dao An, about 1700 years ago. Dayan means “wild goose” and Qigong means “mastery of chi.” The graceful and fluid movements of the form imitate the wild goose—a bird venerated in China for its long life, great strength, ability to travel long distances, and loyalty to its mate. The wild goose represents the Five Constant Virtues of ancient Chinese thought: Ren, ethics and perfect virtue free from selfishness; Yi, right conduct, loyalty and faithfulness; Li, respect, reverence and good manners; Zhi, wisdom, knowledge, cleverness and prudence; and Xin, truth and sincerity. Dayan Qigong promotes the circulation of blood and "qi" (or vital life energy) thereby increasing the body's metabolism and self-regulatory and self-healing systems. The movements also stimulate the brain and improve memory. The form is designed to gradually increase the flow of qi in the body, and develop “qi fields” called dantiens where the qi energy is stored. Dayan Qigong students have experienced improvements in energy, physical health and emotional well-being. Dayan Qigong was passed down as a secret doctrine for 27 generations until the last lineage holder, Grandmaster Yang Meijun, began teaching the Chinese public the form in 1975. Known as "little buddha," Grandmaster Yang Meijun was renown throughout China for her amazing healing abilities. 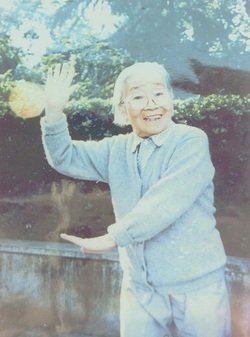 She passed away in 2002 at the age of 108. She was the honorary chair of the Beijing Qigong Scientific Research Society, and through her work Dayan Qigong is one of several forms that has been studied and recognized to have significant health benefits. Master Hui Liu studied under Grandmaster Yang and introduced Dayan Qigong to students in the San Francisco Bay Area. She now has students worldwide. She and her husband, Dr. Y.C. Chiang, founded Wen Wu School in El Cerrito, CA, where classes are offered in Dayan Qigong, Taiji, Shaolin Kung Fu, Chinese calligraphy and brush painting along with a medical clinic offering acupuncture and herbal medicine (www.wenwuschool.com). Recently, a student asked, "Why did Grandmaster Yang Meijun decide to share the esoteric practice of Wild Goose Qigong with the world?" We believe that it was because she felt that it was time. In one of her last conversations with Master Hui Liu, Grandmaster Yang Meijun spoke of the need to reconnect with the earth. She observed that humanities connection to the earth has grown weak. We believe it is time for each of us to realign our energetic bodies, hearts and mind with the life forces. Wild Goose Qigong is one proven way to improve your well being and connect to living systems. We hope you will join our flock!